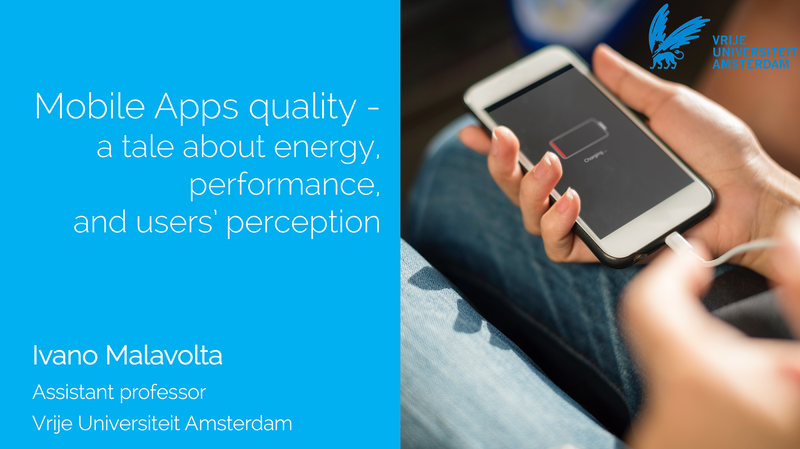 Yesterday I gave a guest lecture at TUDelft about the experiments on mobile apps that we are conducting in our Green Lab in Amsterdam. Here you can find the slides of the lecture. Ivano Malavolta, Stefano Ruberto, Tommaso Soru, Valerio Terragni. Hybrid Mobile Apps in the Google Play Store: An Exploratory Investigation. 2nd ACM International Conference on Mobile Software Engineering and Systems (MOBILESoft 2015) [PDF]. Ivano Malavolta, Stefano Ruberto, Valerio Terragni, Tommaso Soru. End Users’ Perception of Hybrid Mobile Apps in the Google Play Store. IEEE International Conference on Mobile Services (MS 2015) [PDF]. Thanks Fabio Palomba and Luca Pascarella for the invitation! ← Are service workers draining my battery?